Hello! My name is IM Artiom Tsepotan from Ukraine. My best students have been 2012 Women’s World Champion, GM Anna Ushenina, and the youngest ever US National Master (at 9y 3m 22d), Liran Zhou. I hold a Master's Degree in Education and have been a Top-10 ICC teacher since 2006. Do you feel that you are stuck at the same level, don’t know how to improve and wonder why chess engines can’t really help you? "I have many, many chess books and software but I find myself jumping around and not staying on track", one student said. 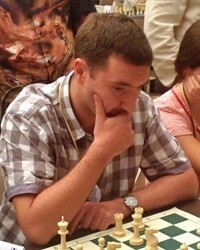 I am convinced that examining your games is the key to improving your chess skills. Our chess study plan will depend on identifying your chess weaknesses from your recent games. My son has been with IM Artiom for one year. He has made firm and steady progress since then. I can see he’s become more and more confident in tournaments and gradually defeated opponents whom were impossible for him to win before. Artiom is highly efficient and organized. So, every lecture he gives is solid and serious. Homework targeted at weak points from his systematic puzzles library will be followed suit. Also, he will make comments, conclusions or reminders in email to keep me informed of my son’s learning. Artiom is responsible and responsive. He is on time as scheduled. When I ask extra questions about chess, he can always gives me satisfying answers in exact words when he can. Finally but not the least, Artiom is good at encouraging kids which suits well with my son’s personality. On the other hand, he will tell me honestly and mildly to seek proper solving way if he’s found something wrong with my son. I think it’s important and precious for a good coach. Anyway, your kid will be in good hands if you choose IM Artiom! My daughter started chess lectures with coach Artiom. We are happy with her progress. Artiom is very responsible and well prepared the class. He can identify my kid's weakness and target that problem and training her. We are happy with her progress. Artiom has been helping me for a number of years now to go from 1400+ to 2000+ on ICC. Over the years, Artiom has been willing and able to use different methods to fit the way that I learn best. He has also been very patient, has been clear with his explanations, and has politely explained something over again if I need to hear it again.